Cytotoxic CD8+ T-cells are key players of the immune responses against viruses. During the priming of a CD8+ T-cell response, the activation of a naïve T-cell by a professional antigen presenting cell (APC) involves the induction of various intracellular and metabolic pathways. The modulation of these pathways at the level of APCs or T-cells offers great potential to enhance the induction of robust effector cells and the generation of long-lived memory cells. On the one hand, signaling through pathogen recognition receptors (PRRs) expressed by APCs can greatly influence T-cell priming, and the potential of several PRR ligands as adjuvants are being studied. On the other hand, the engagement of several metabolic processes, at play in APCs and T-cells upon stimulation, implies that modulating cellular metabolism can impact on priming efficacy. Here, we review recent efforts to understand the interplay between PRR mediated signaling and metabolic pathway modulation in this context, through three examples: interplay between TLR4 and fatty acid metabolism, between TLR9 and IDO, and between STING and autophagy. These initial works highlight the potential for harnessing the induction of antiviral CD8+ T-cell responses using synergistic modulation of metabolic and PRR pathways. CD8+ T-cells are major actors of the fight against viruses. Owing to their capacity, through T-cell receptor (TCR)—peptide Major Histocompatibility Complex (pMHC) interactions, to recognize a diversity of antigens presented on virus infected cells, CD8+ T-cells can directly kill target cells. However, rather than their quantity or frequency, their quality, or aptitude to engage multiple effector functions, represents an important basis of their efficacy in viral infection settings (1, 2). Induction of CD8+ T-cells with superior qualitative properties is therefore a primary goal of vaccines and immunotherapies in this context. 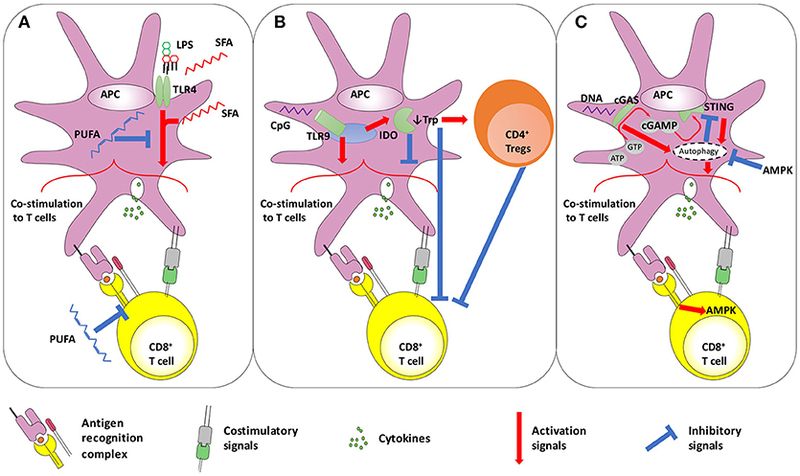 The acquisition of functional attributes by CD8+ T-cells is crucially dependent on the priming step of the response, when antigen specific naïve precursors get activated and expand in response to the presentation of their cognate antigen by dendritic cells (DCs) (3, 4). In recent years, we have gained increasing knowledge about the determinants of the quality of CD8+ T-cells, and how to influence them upon priming. For instance, dendritic cells (DCs) govern the nature of primed CD8+ T-cells via the provision of processed antigens in the form of pMHC class I molecules (signal I) and other important signals, including costimulatory interactions (signal II) and inflammatory cytokines (signal III) (5). Much effort has been focused on the modulation of DC function through pathogen-recognition-receptor (PRR) triggering (6, 7), as PRR ligands can modulate these different signals and thereby enhance the priming process to elicit more robust T-cell responses (7–9). Molecules, such as Toll-like receptor (TLR) ligands, can improve the immunogenicity of antigens by mimicking pathogen-associated “danger” signals in order to improve T-cell immunity (10, 11). Moreover, new insights into cellular metabolism have underlined the tight connection existing between metabolic and functional properties of immune cells (12). For instance, recent studies have demonstrated that aerobic or catabolic metabolic processes and mitochondrial biogenesis control CD8+ T-cell effector and memory cell formation (13, 14). In response to activation, CD8+ T-cells undergo a metabolic transition or reprogramming. Quiescent naive T-cells have a low metabolic demand and rely primarily on oxidative phosphorylation (OXPHOS) (15, 16). Upon activation though, they switch to a AKT/mTOR-orchestrated reliance on multiple metabolic pathways including aerobic glycolysis, glutaminolysis and OXPHOS, which are important for the acquisition of effector functions and sustained proliferation (15–18). Eventually, memory CD8+ T-cells regain a more catabolic metabolism and preferentially rely on fatty acid (FA) synthesis to fuel FA oxidation and enhance mitochondria respiratory capacity, and thus provide survival advantages (19). Cellular metabolic intermediates are therefore major regulators of CD8+ T-cell activation and can dictate functional performance of effector cells upon priming (20). This opens new avenues to modulate cellular metabolic activity in order to promote the induction of high quality immune responses and enhance antiviral as well as antitumor CD8+ T-cell immunity. In this review, we discuss initial considerations regarding the metabolic parallels between PRR- or TCR-mediated stimulation, and recent works highlighting how the quality of primed CD8+ T-cells may be altered through metabolic regulation of T-cells or DCs using PRR agonists. The activation of both APCs via PRRs and T-cells via TCR is energetically reliant on the adoption of anabolic processes, and in particular on the consumption of glucose and production of lactate by a metabolic pathway called Warburg metabolism or aerobic glycolysis (15, 21–27). The rapid engagement of glycolysis has been shown in response to a broad array of PRR agonists, including ligands for TLR2, 4, 7, 9, and C-type lectin receptors, and is essential to support their stimulatory effects (22–25). Similarly, glycolysis is required for differentiation into effector cells and cytokine secretion in T lymphocytes upon TCR-mediate activation (26, 27). The anabolic processes that regulate the activation of both DCs and T-cells are under the control of mTOR (15, 21), which is essential for differentiation of T-cells (28, 29) as well as for the maturation, differentiation, survival and T-cell stimulatory activity of DCs (21, 30–34). The glycolytic burst occurring in APC and T-cell upon activation is also supported by mTOR, via the transcription factors Hypoxia-inducible factor-1α (HIF-1α), that prompts the expression of key glycolytic enzymes (35–37). However, it has been reported that TCR-induced proliferation may occur also in the presence of mTOR inhibition (28, 29), which instead improves pro-inflammatory effects of TLR stimulation, resulting in enhanced IL-12 production and reduced IL-10 release by DCs (33, 38, 39), depending on the DC type (33). Therefore, the exact involvement of mTOR in integrating TCR and PRR signaling is not completely understood, and clues indicate a different role for this kinase in DC and T-cell activation. Of note, TLR-induced metabolic reprogramming involves also the activation of de novo fatty acid synthesis (FAS) (23), required for the production of membranes to expand organelles (23). Interestingly, FAS is induced also after T-cell activation, and necessary for their expansion (12, 40). The induction of FAS upon PRR and TCR stimulation leads to the storage of fatty acids in lipid droplets (23, 41), whose function still remains controversial. Indeed, DCs with high content of lipids have been shown to better activate T-cells in the liver (42) but displayed diminished priming capacity within tumors (43). In addition, while storage of FA into triacylglycerol may be a mechanism exerted to avoid lipotoxicity (44), excess on neutral lipids has also been shown to induce apoptosis in T-cells (45). The canonical Toll-like receptor 4 (TLR4) signaling cascade is initiated when lipid A (the membrane anchor of lipopolysaccharide [LPS]) is bound by the extracellular region of CD14, which complexes with MD2 and binds to membrane-bound TLR4 (46). Dimerization of these molecules with another lipid A-MD2-TLR4 complex creates a functional TLR4 signaling complex (47). Binding of a TLR4 agonist like lipid A initiates an innate immune response that can drive the development of antigen-specific acquired immunity (48). Mimicking the innate sensing of molecular patterns derived from microbes—pathogenic and non-pathogenic—to activate of immune cells, TLR4 agonist molecules show great promise for use as immunotherapeutic adjuvants to potentiate host responses in component vaccines [Reviewed in Reed et al. (48)]. With respect to metabolism, TLR4 stimulation has been linked with FA-induced inflammation in a number of pathologic conditions, including insulin resistance, retinal impairment, atherosclerosis and myocardial injury observed during diabetes and obesity (49–54). Long chain, saturated FAs (SFAs) require TLR4 to exert pro-inflammatory effects (55), and have been suggested to bind it (53, 56). Lipid A itself is acylated with SFAs (57), whose number, length and saturation determine the TLR4 agonistic properties of LPS (49, 57). Conversely, poly-unsaturated FAs (PUFAs) inhibit TLR4 activation (49, 58). Notably, a similar pattern has been shown for another bacterial cell wall sensor, TLR2 (59). More recently, it has been proposed that SFAs may act as agonists of TLR4 without binding it (55, 60). SFAs may indeed be able to induce TLR4 dimerization in lipid rafts, in a ligand-independent manner (61), a step that is inhibited by PUFA. Irrespective of the mechanisms, evidence is concordant in suggesting that saturated and polyunsaturated FAs exert opposite effects on TLR4-mediated inflammatory response and APC activation. Indeed, SFAs may up-regulate the expression of costimulatory molecules and cytokines, resulting in increased T-cell activation capacity, while these effects are inhibited by PUFA (62). Several lines of evidence suggest that PUFA may reduce the induction of T-cell responses (63–65), acting on both APCs and T-cells. In addition to preventing TLR4 dimerization in lipid rafts and inhibiting downstream kinases (61, 66), PUFA can affect lipid rafts composition in T-cells, altering TCR signaling (67, 68) and resulting in hampered T-cell functionality (68–70). Overall, SFAs may favor co-stimulation delivered by APCs to T-cells and favor both TLR4 and TCR signaling (71), thus potentially boosting priming capacity (Figure 1A). Figure 1. Schematic representation of the interplay between (A) TLR4 and fatty acid metabolism, (B) TLR9 and IDO, and (C) STING and autophagy. (A) TLR4 activation on APCs improves CD8+ T-cell priming. In addition to LPS, SFA are also thought to trigger TLR4. However, it has also been proposed that SFA act on TLR4-downstream pathways. In contrast, PUFA display anti-inflammatory effects, by dampening both TLR4- and TCR-induced signaling. (B) Dual role of TLR9 stimulation on T-cell activation. The TLR9 ligand CpG shows adjuvant effects, improving the co-stimulation delivered by APCs to T-cells. However, some reports highlighted that the same pathway may also trigger negative regulators of immunity, such as IDO that down-modulates APC-provided co-stimulation and favors Treg activity. Furthermore, IDO mediates tryptophan deprivation, with has negative consequences on T-cell functionality. (C) The autophagy-STING loop. The cytosolic DNA sensors cGAS converts ATP and GTP into the dinucleotide cGAMP, which triggers STING. Both cGAS and STING may promote authophagy, that can be involved in two distinct processes: inducing APC-delivered co-stimulation to T-cells, and STING degradation to avoid its permanent activation. The latter process seems under the control of AMPK, a kinase also acting in downstream TCR signaling in T-cells. AMPK, AMP-activated protein kinase; APC, antigen presenting cell; ATP, Adenosine Triphosphate; cGAMP, cyclic guanosine monophosphate–adenosine monophosphate; cGAS, cGAMP synthase; CpG, CpG oligodeoxynucleotides; GTP, Guanosine Triphosphate; IDO, Indoleamine 2;3-dioxygenase; Trp, tryptophan; LPS, lipopolysaccharide; PUFA, poly-unsaturated fatty acids; SFA, saturated fatty acids; STING, stimulator of interferon genes; TLR, toll like receptor. However, the role of specific FA species on T-cell functionality is not yet completely understood (44). Although it appears clear that FA are required during T-cell expansion (72), their excess may result in reduced T-cell proliferation and increases apoptosis (44, 73), and their use as energy source (fatty acid oxidation—FAO) was initially considered not to contribute to T-cell expansion following priming (74), although important for the transition of primed T-cells toward memory (74). Conversely, it has been recently discovered that FAO may sustain metabolic shift occurring upon TLR4 and TCR stimulation, in low glucose concentration conditions (75, 76) and during graft-vs.-host disease (77), suggesting a potential role for FAO in T-cell priming. SFA-mediated pro-inflammatory signaling requires their ligation with coenzyme A, a necessary step for SFA oxidation (55), indicating that FAO may be important to facilitate pro-inflammatory effects. This indicates therefore that the enhancement of FA catabolism may synergize with TLR4 activation to boost T-cell priming. Although further studies are necessary to better understand the underlying mechanisms, three hypotheses about the role of FAO in boosting T-cell priming may be proposed: (i) the induction of pro-inflammatory signals; (ii) the provision of additional energy sources to the activated APCs and T-cells, and (iii) the removal of high (and potentially toxic) concentration of SFAs or of FA with inhibitory activity (such as PUFA). TLR9 is an endosomal receptor recognizing specific unmethylated CpG motifs present at high frequency in bacterial genome but absent in the mammalian one. TLR9 signals via the adaptor protein MyD88, leading to the production of pro-inflammatory cytokines (after activation of the NF-κB pathway) and type I interferon (after activation of the IRF7 pathway) (78–80). Interestingly, TLR9 has also been identified as a specific sensor of RNA:DNA hybrids, a key intermediate component essential to the replication during infection. The use of TLR9 agonists as vaccine adjuvant presents a great potential [Reviewed in Scheiermann and Klinman (81)], and DNA vaccines containing unmethylated CpG motifs show an enhanced immunogenicity (7, 82). Nonetheless, increasing evidence indicates that TLR9 stimulation may also have immunosuppressive/tolerogenic effects. Despite the lack of consensus on this issue, the major mechanism explaining this phenomenon is the TLR9-mediated modulation of Indoleamine 2,3-dioxygenase (IDO), that catalyzes the first step of tryptophan catabolism (Figure 1B). In vivo systemic treatment with different TLR9-ligands could decrease the onset/severity of autoimmune diseases but increase susceptibility to infections in a IDO-dependent manner (83–87). Indeed, high CpG oligodeoxynucleotide doses may induce IDO in pDCs and splenocytes (86, 88), reducing the secretion of pro-inflammatory cytokines and favoring the expression of PD-L1, fostering the acquisition of suppressive activity by Tregs (89) and reducing antigen-specific T-cell expansion (86, 88, 90). Nonetheless, TLR9-mediated IDO induction of immunosuppressive properties depends on the type of TLR9 ligand used, as well as on the dose and route of administration (85–87, 90). The induction of IDO expression is a well-known immunosuppressive mechanism, which is also observed in several viral infections (91, 92). In addition to TLRs, IDO expression may also be induced upon stimulation of several receptors, including those for type I and II interferons, CD40L and TGFβ (93). Tryptophan degradation in the kynurenine pathway (KP), whose first step is mediated by IDO, may lower the concentrations of this amino acid, essential for cell survival and proliferation, and result in the synthesis of KP metabolites with immunosuppressive activity (93). Tryptophan depletion inhibits mTORC1 activity in T-cells as well as their proliferation (93, 94), while moDCs and pDCs expressing IDOs might prompt Treg expansion and suppressive activity (95, 96). As a result, T-cell priming efficacy and the generation of robust antiviral and memory responses was shown to be ameliorated by the use of IDO inhibitors in vivo (97–99). The use of IDO inhibitors may therefore reduce immunosuppressive effects of TLR9 ligands and boost its adjuvant activity, favoring the induction of strong antiviral and antitumor T-cell responses (Figure 1B). In the recent years, a strong enthusiasm for the study of the stimulator of interferon genes (STING) pathway has led to a better knowledge of the complexity of cytosolic DNA sensors (100). First identified as an adaptor protein mediating innate immune signaling induced by cytosolic DNA sensors, STING's function as cyclic di-nucleotide sensor has been described only recently (101), generating great enthusiasm for its potential use in cancer immunotherapy [Reviewed in Iurescia et al. (102)]. STING is a receptor for cyclic guanosine monophosphate–adenosine monophosphate (cGAMP), which can be synthesized by cGAS (cGAMP synthase), a member of the nucleotidyl transferase family. The latter plays a role in the recognition of HIV and other retroviruses leading to the synthesis of cGAMP (103). The produced cGAMP acts as an endogenous second messenger that binds to STING, leading to the activation of IRF3 and the induction of type I interferon synthesis (101). In addition to its major role for RNA virus sensing, it has been shown that cGAS expression also broadly inhibits several DNA viruses. However, the effect of cGAS is not limited to viruses. It acts as a DNA sensor responsible for the recognition of Mycobacterium tuberculosis, leading to the activation of the STING pathway. The recognition of this bacteria, as well as others, is made through cyclic-di-AMP, a bacterial cyclic di-nucleotide (CDN) leading to the production of IFN-β. CDN are also able to stimulate STING directly, and to activate an innate immune response leading to the induction of type I interferons. Interestingly, it has been demonstrated that RNA:DNA hybrids are also sensed by the immune system through the cGAS-STING pathway, inducing a strong type I interferon response. cGAMP has proven to be an effective adjuvant, able to boost the production of antigen-specific antibodies and T-cell responses after an intramuscular administration in mice. It has been recently evidenced that cGAMP is a promising mucosal adjuvant. STING agonists are also novel and highly promising immunomodulators for cancer immunotherapy (104). Its activation by CDN has proved to be efficient for anti-tumoral vaccination against metastatic breast cancer. Surprisingly, the STING pathway can also be triggered upon mitochondrial damage through the generation of mitochondrial ROS and the release of endogenous DNA into the cytosol. Increasing evidence indicates that pathogen-derived CDN may trigger autophagy via STING (105–107), which forms cytoplasmic structures with LC3 and Atg9a, two proteins involved in the autophagy process (108). However, controversies exist about the significance of STING-induced autophagy. Indeed, STING and TBK1 migrates together via an autophagy-like process (109), and autophagy inhibition in cells infected with viruses known to activate STING dampens type I interferon production (107, 109). This suggests that autophagy seems essential to STING mediated pro-inflammatory effects (Figure 1C). Consistently, downstream STING type I IFN induction is dependent on Vps34 (110), a phosphatidylinositol 3-kinase (PI3K) required for autophagy initiation (111). However, other two important autophagy-related proteins, Beclin-1 and the serine/threonine protein kinase ULK1, are dispensable for STING pro-inflammatory effects (110) but, rather, involved in STING degradation. ULK1 is activated, after the formation of STING-dependent autophagosomes, by the same cyclic dinucleotides that activate STING, but mediates its phosphorylation and blocking (110), while Beclin-1 interacts with cGAS to promote autophagy in a STING-independent manner, dampening interferon responses (112). Thus, autophagy would prompt STING degradation to avoid its chronic activity (110, 113). The dual role of autophagy in STING stimulation, delivering STING pro-inflammatory signaling at first and then mediating its degradation, suggests a temporal biphasic function of this metabolic process. Interestingly, a similar pattern has been described in T-cell activation: autophagy has been shown to first support NF-κB signaling in T-cells to then downregulate it (114, 115). Autophagy is activated and needed at the beginning of TCR stimulation to sense, and thus activate, mTOR (116, 117); then mTOR itself shuts down autophagy, which seems no longer required for effector cell generation, although essential for memory cell formation (117–119). Further studies are needed to investigate which autophagy-related proteins should be targeted to improve STING adjuvant effects, enhancing downstream signaling and postponing its degradation to ensure prolonged STING activity at least during the initial phases of T-cell priming. Notably, cGAS-Beclin-1 mediated STING regulation is prompted by ligands, but not products of cGAS (such as 2′3′cGAMP), suggesting that the use of direct STING agonists may overcome this control mechanism leaving unaffected STING-induced autophagy. In addition, as the ULK1-dependent negative feedback is regulated by AMPK (110), whose inhibition leads to ULK1 activation, STING degradation and type I IFN response reduction (110, 120), AMPK activators might be used to prolong STING activity. It should be noted that AMPK has often been considered as anti-inflammatory, also for its capacity to suppress mTOR activity (121), which is required for T-cell activation. Nevertheless, AMPK activation occurs during and is essential for primary T-cell responses (74, 121, 122), may boost the generation of memory cells (74, 121), restore the functionality of exhausted effector cells (123) and generate robust effector cells starting from naïve cells (121, 123). Therefore, the potential use of AMPK activators in combination with STING ligands for priming of T-cell responses should be further explored with the aim to prolong STING pro-inflammatory activity, counteract exhaustion and prompt the generation of the memory pool. The discovery of PRRs and their ligands certainly represents one of the most fundamental advances of modern immunology with many, some yet to discover, applications in the context of vaccine development. In the recent years, our growing perception of the importance of immunometabolism is also opening new directions for immune interventions. Although it is still early days, the examples discussed in the present review provide clear evidence that combining our knowledge on metabolic immune regulation and PRR pathway activation offer great potential to influence the induction of potent immune responses. It will be important to assess the prospective use of such therapeutic approaches in animal or pre-clinical studies in order to better characterize benefits and drawbacks of these strategies in in vivo settings. Eventually, the combination of metabolic regulators and PRR based adjuvants may prove particularly effective in context of difficult to vaccinate populations, such as the elderly, whom immune cells present both metabolic and functional alterations, and overall suboptimal immune responsiveness. FN, SP, and VA reviewed the literature and wrote the manuscript. FN was funded by the Agence Nationale de la Recherche (ANR Project 14-CE14-0030-01). Copyright © 2018 Nicoli, Paul and Appay. This is an open-access article distributed under the terms of the Creative Commons Attribution License (CC BY). The use, distribution or reproduction in other forums is permitted, provided the original author(s) and the copyright owner(s) are credited and that the original publication in this journal is cited, in accordance with accepted academic practice. No use, distribution or reproduction is permitted which does not comply with these terms.